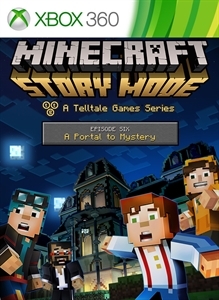 Purchase of this additional content requires Minecraft: Story Mode - Episode 1: The Order of the Stone. Episode six of an eight part episodic game series set in the world of Minecraft. Continuing their journey through the portal hallway, Jesse and crew land themselves in another strange new world - one completely overrun by zombies. With a timely invitation to take refuge in a spooky mansion, they find themselves thrown into a thrilling mystery.